HABIT: Upright, thick succulent stems. Many colors and characteristics available. Blooms mid summer to fall. Large leaves from compact bushes. CULTURE: Easy to grow in any well-drained soil, moderate water and fertilizer requirements. Native to the southern USA. USES: Summer flower color, specimen, pots. 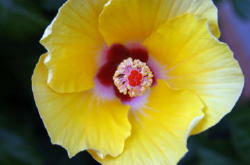 NOTES: There are many other hibiscuses that are wonderful plants. The tropical H. rosa-sinensis, which functions as an annual here, is the most colorful, but the hardy rose mallows are beautiful and perennial: ‘Frisbee,’ ‘Southern Belle,’and ‘Marsh.’ Another wonderful perennial is Texas star H. coccineus, H. taiwanwnsis is a durable, fast growing fall bloomer. Confederate rose is H. mutabilis.